Many years ago, a couple of places contentedly nestled in a secluded place on the upper land areas of Anda. These are Abihid and Tayod. They used to be a sitios of Barangay Casica and were served as hiding place or den of several people especially during World War II. On 1967, during the administration of Mayor Teodulfo Amora, people of two sitios unanimously appealed to the Mayor and members of the Council to join in together and be declared as an independent barangay of Anda. The members of the sangguniang bayan painstakingly reviewed all resolutions to that matter and Congressman Teodoro Galagar, who that time was a representative for the 3rd District of Bohol personally transmitted all pertinent papers to the Congress and abruptly on 1968, the two sitios in the hinterland which was merged together, was approved and declared as Barangay Katipunan. But one of the most interesting stories of this place is the origin of Sitio Abihid. Long time ago, all people living in this place is hardworking. They toiled so hard in order to survive. Most of the men were engaged in farming while the women were weaving mats, baskets and other home making products. They were all contentedly doing their daily routine until one day, the sitio experienced an event that kills a lot of people and destroys so many things-holocausts as what they called. Children and babies were seriously affected thus, they were quarantined for almost a month and never had a chance to go out. The head of the place was becoming uneasy and troubled and must find an antidote as early as possible. They enlisted the help of several quack doctors to help them but unfortunately none of them gave a remedy for the worsen malady. One day, a poor boy appeared and ran towards him. He gave bundle of leaves to the leader of the sitio and told him that the leaves would be the solution to their problem. Initially, he was doubtful of what the child has said. So he asked his name. The boy answered “Abi”. But in an instant, he turned around and the boy vanished instantly. The leader started to wonder on how to use those leaves, until it came to his mind to place all leaves in boiling water and give it as an herbal tea. Fortunately, all patients got well and eventually all of them cured. The people of that place were much grateful to Abi so they decided to name their place as Abihid. Presently, Barangay Katipunan continues to work hard to live. Most of the people are engaged in farming as well mining manganese. BLUE HEAVEN – serves as a boundary for three barangays of Katipunan, Buenasuerte and Tanod. 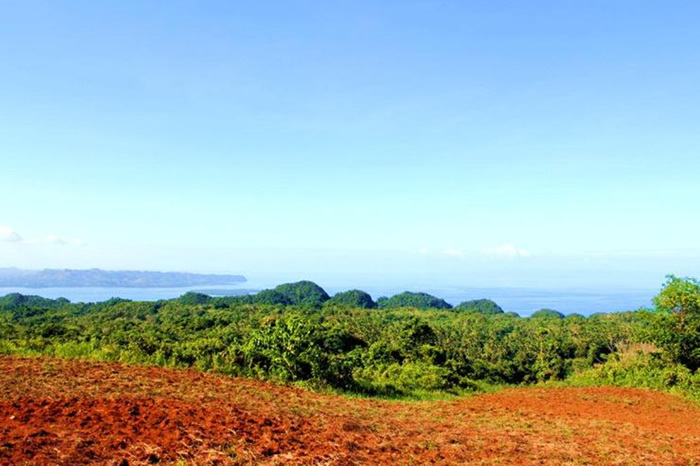 This is considered as Anda’s prominent and the highest peak which offers a breathtaking view of the town and its neighboring towns and islands. MAT & HAT WEAVING – One of the premier industries in the barangay of Katipunan which is exclusively woven by Katipunan women. Woven bed mats, caps & other products are transmitted out in the province with various sizes, designs, colors and a unique touch from the warmth of its people. SAINT VINCENT FERRER AND SAINT ISIDORE LABRADOR FIESTA CELEBRATION – The biggest and the grandest fiesta celebration in Katipunan wherein two patrons are being celebrated simultaneously in two sitios Tayod and Sitio Abihid. Two venues for grand discos, sports fests, nightly shows, among others that surely everybody will be in the festive mood. CHRISTMAS PARTY & NEW YEAR’S DAY CELEBRATION – Slated every December 25, witness the several houses come alive in a blaze of twinkling lights. The moment where all folks will gather together and share their foods, gifts are being unwrapped and fabulous presentations from different groups is something to look forward to. AVOCADOS – Katipunan is known as one of the major producer of sweet and luscious avocados in town. AFRICAN DAISY – Because of its cool climate, Katipunan has a wide variety of flowers sprouted in different areas. One of which is African daisy-belonging to the family Asteraceae (formerly Compositae). African daisies make up the genus Arctotis. Arctotis genus is natives to southern Africa. These are abundantly grown in gardens that have good soil and sun. BANANAS – Grown extensively in all tropical areas, Katipunan also has a wide variety of bananas. TARSIER – Experience a close encounter with Tarsiers or Mawmag in their natural habitat. Spotted in hills of Katipunan. MONKEYS – There are few monkeys spotted in the forests of Katipunan but unfortunately, today they face a much graver threat through deforestation and being hunted for food. Protection for these endangered species are now being strictly implemented by their local officials. CARABAO – The domesticated water buffalo, or carabao, is common throughout the islands, especially in the province. They are considered as the “right hand” of every farmers in Katipunan in cultivating their land, as well as, helping them in transporting their goods to different areas.